Sue Kang is a potter from Korea who has been practicing ceramic arts in both the Bay Area and her native country for more than 30 years. She studied at Ehwa University and the University of Delaware, and served as a curator for the National Museum of Korea. 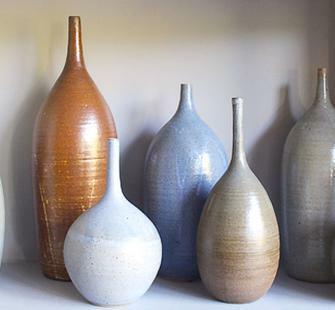 Her work reflects her life in Califor­nia as well as the legacy of Korean ceramic culture. Her focus is on functional, yet beautiful pieces that are relevant to our everyday life, and her pieces can be seen locally at Sue's Gallery Cafe in Saratoga. Learn how to create simple and complex ceramic forms, working on Montalvo’s pottery wheels. Various building, trimming, glazing, and surface design techniques will be demonstrated. A small group size ensures individual guidance. Your enrollment fee includes six Tuesdays of instruction and five Thursdays of optional additional studio time, during which you can continue to explore your developing clay skills. A studio supervisor will be present at these studio sessions to answer questions and provide feedback and guidance. During this first week, we will introduce students to the basics of working with clay by going over tools, learning about clay in its many forms, and practicing hand building. Hand-building will help students understand how to handle clay and we will also create test pieces for glazing. For this class, students will learn how to center on the wheel. We will also demonstrate the right form and posture for throwing on the wheel. After practicing centering, students may progress to start making cylinders, the most fundamental shape to practice on the wheel. Students should aim to make four to five pieces over the course of the next three weeks. Students will continue practicing making cylinders. We will also go over the basics of different tableware, namely bowls, vases, cups, and plates, and demonstrate how to throw each piece. During this week, we will also take the greenware pieces from last week's class and learn to trim. After this week, acceptable pieces will go through the first bisque firing. As a continuation from Week 3, students will practice throwing and hopefully make several pieces they are happy with. This week's class will largely consist of one-on-one sessions with Sue. With some pieces out of bisque firing, we will introduce students to the art and science of glazing. Students will learn what makes each glaze different, and how the firing process transforms glazed pottery. All students should wrap up and trim all pieces that they want glazed in the next week. After this week, all pieces will go through another bisque firing. For our last class, we will focus on glazing all remaining pieces and reviewing all skills learned during the course.